Help us honour James Knox Paterson's service by contributing information, stories, and images so that they can be preserved for future generations. From the book Fallen Saints - James Knox Paterson of Unley was born at Semaphore, South Australia and after leaving St Peter’s College travelled to the United Kingdom where he joined the Royal Naval Reserve. An article published in the School Magazine in September 1919 gives some idea of his activities immediately before his death. 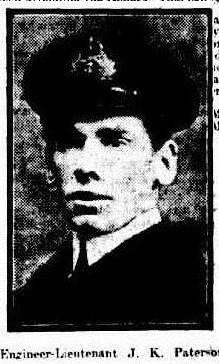 Thirty year old Engineer Lieutenant James Knox Paterson was serving aboard the Paddle steamer minesweeper HMPMS Ascot when it was torpedoed and sunk by German submarine UB 67 off the Farn Islands the day before the signing of the armistice; it was the last ship to be sunk by enemy action in the Great War. His brother Sergeant William Paterson (OS) an original member of 3rd Light Horse Regiment suffered a severe gunshot wound to the head at Gallipoli but rejoined his unit at Destroyer Hill on 29 September. He returned to Australia in 1919. On 4 March 1942 William’s son, Able Seaman James Knox Paterson, Royal Australian Naval Reserve was aboard HMS Anking when the Japanese sank it; he was 19 years of age. Showing 4 of 4 images. Trove digitised Newspaper Article - OUR HEROES. Trove Illustrated Newspaper Article - ENGINEER SUB-LIEUT. J. K. PATERSON.